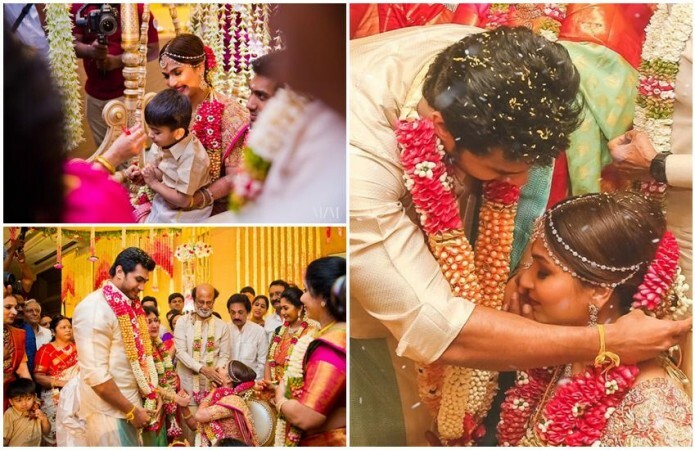 Here are some best pictures from the wedding and reception of Soundarya Rajinikanth with Vishagan Vanangamudi. The elaborate marriage ceremony of Soundarya Rajinikanth's marriage with Vishagan Vanangamudi has come to end with the wedding reception held at an upscale hotel in Chennai on Monday evening, 11 February. It was kick-started with a pre-wedding event on Friday, 8 February followed by sangeeth, mehendi and the wedding. The event has become the talk of the town as it was graced by big names from the film industry and politics. Tamil Nadu Chief Minister E Palaniswami, his deputy O Paneerselvam and many other leaders from the ruling AIADMK were present at the wedding. MK Stalin, the leader of the opposition, his estranged brother MK Alagiri, former union minister Dayanidhi Maran, MDMK leader Vaiko, and a host of politicians from the other political outfits had their attendance. There was a long list of celebrities from film industry who attended the wedding. Mani Ratnam with his wife Suhasini, Pa Ranjith, KS Ravikumar, K Bhagyaraj, Nakkeran Gopal, Vairamuthu, Kalaippuli S Thanu, AVM Saravanan, Mohan Babu, Lakshmi Manchu, Kamal Haasan, Khushboo, Sivaji, Meena, KA Chandrasekhar with his wife Shobha, Kasthuri, Shankar Narayanan, Arun Vijay, Manjima Mohan, Aditi Rao Hydari, Andrea and many other big names were spotted at the event. For the wedding, Soundarya wore a green and red silk saree, whereas the groom donned the traditional white and gold shirt and dhoti. Later, the bride was seen in a beautiful pink and gold saree, a Abu Jani Sandeep Khosla creation. Vishagan donned a cream silk shirt with veshti with blue border. Soundarya Rajinikanth donned a red bridal lehenga accessorized with heavy diamond jewellery. Whereas the groom looked dapper in a black suit paired with a white satin shirt and a scarf. Bollywood actress Kajol Devgn had flown down to Chennai for the wedding and her picture with Soundarya Rajinikanth has now gone viral.